A chicken farm in Gyeonggi Province reported a suspected case of avian influenza (AI) on Wednesday, prompting quarantine officials to impose a temporary ban on poultry transportation in the region. The farm with 197,000 laying chickens in Pocheon, 45 kilometers north of Seoul, reported that about 30 birds have died since Tuesday, and the preliminary test showed that they were infected with AI, the Ministry of Agriculture, Food and Rural Affairs said. 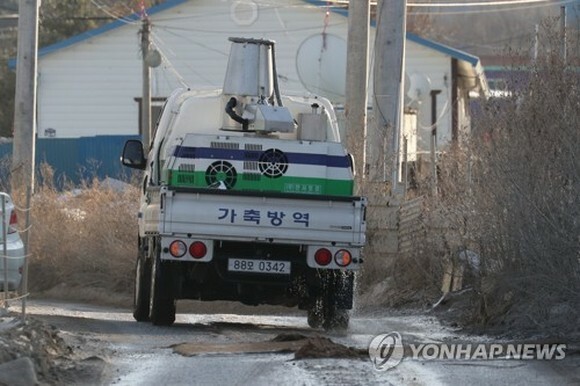 Quarantine officials imposed a 48-hour standstill order on poultry, equipment and livestock breeders in Gangwon Province and Cheorwon, east of Pocheon, the ministry said. As part of preventive measures, the government will cull all remaining chickens and conduct inspections into farms within 3 kilometers of the affected region to prevent further spread of the highly contagious virus. An in-depth analysis is currently underway to figure out whether the case involves a highly pathogenic strain, which leads to high death rates for birds, the ministry said. The latest case, the first in Gyeonggi Province, raised further alarms among quarantine officials, as highly pathogenic bird flu has been spreading across the country's southwestern region, a major poultry production area, since November. On Wednesday, the government confirmed a total of nine poultry farms in Jeolla Province have been infected with the virulent H5N6 bird flu virus. The government said it culled 36,700 ducks at three farms and has been carrying out disinfection at poultry farms and butchering facilities in the region.